« The rain in Spo-kane falls gently on the monoplane (roof). 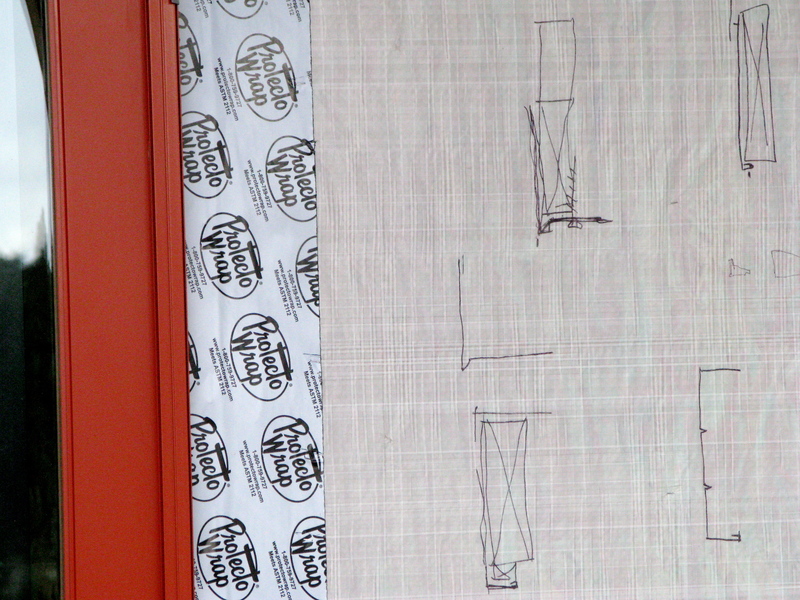 A must for any job site: sketches of design options on the side of the house. We’ve been working hard. The past week has been marked by great progress though. Whenever we’re working on something big there’s an opportunity for project fatigue to set in. The soffit is a good example of this. After five or six days of non-stop work, holding heavy plywood and finishing nailers above our heads, the idea of being finished and moving on to something new becomes more appealing. Last week we made it through a number of big things. Windows? Installed–even the 500 pound monster that just about killed us. Soffit? Complete tomorrow. Support brackets? Installed (well, mostly anyway). So now it’s on to interior framing (for Jesse and Scott), and installing exterior trim and building a few more cabinets (for my father and me). What’s up with window trim? Could there be more options to consider, weigh, obsess about and debate? Matt said to K the other day that he can tell how much thought went into a house by how the trim is detailed. If this is the case, we’ll have the most thoughtful house ever. Friday afternoon. Jesse with an IPA, Scott with a Stella. Tiredness all around. Looking like a real house. See how the corners of plywood perfectly align? This is harder to pull off than it looks! Evidently if you’ve lived in Japan, you MUST flash the rabbit ears whenever a camera comes out. New support posts / exotic dancing location. Courtyard, living room, courtyard, meadow. Nice. K calls it a crack house with the nicest ceiling ever.